A Simple tool for Honing the plane irons of different model of the carpenters irons bench plates such as jack Planes, Block Planes, Plough Planes,Spokeshaves,Chesils & the mortise of the width ranging from 3mm to 65mm. The Plane irons & other cutting tools are gripped from both the sides between the two simultaneously moveable and reversible jaws of the guide and tightened on the top by the knurled screw clamp to strongly hold the tool in its position while honing. 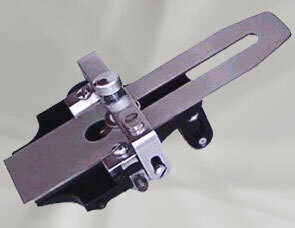 The knurled screw clamp can be use in two positions (forward & backward) provided in the guide. 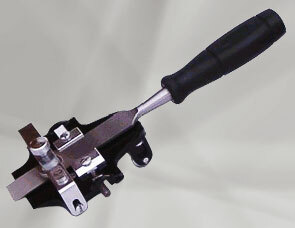 The simultaneously moveable (outward & inward ) jaws of the guide are operated by rotating (clockwise & anti clockwise) The knurled screw head of the left & right hand thread screw ,underneath the guide. The honing guide is free moveable on the steel rollers made of good quality steel. The correct honing angle is 30 degree & the sharpening angle is 25 degree of the cutting tool is achieved by shifting the roller at the rear end of the guide of its respective position of 30 degree & 25 degree marked on the guide. Free Rollers : Best quality Steel. Individually cartoned in a display box of three. Multi Edge Honing Guide No.